Articles concerned mainly with China’s interstate relations. A lot has been written recently about the Chinese Communist Party’s anti-corruption campaign under President Xi Jinping, particularly following the arrest this week of Zhou Yongkang, former member of the Standing Committee of the Politburo, the highest executive body of the Party, where he served as head of the security apparatus, with powers reaching into the courts, police, intelligence and paramilitary forces. Some have called this unprecedented arrest of a high official “tearing up the rulebook” in Chinese politics. But I wish particularly to respond to this video by StratFor, an American think tank known for its geopolitical determinism. It describes the anti-corruption campaign as going deeper than ever before, and even as a break with the consensus-driven, gradualist model of party governance instituted by Deng Xiaoping following the death of Mao and the end of the disastrous Cultural Revolution. Not surprisingly, they attribute the change to a crisis in Party legitimacy. I would like to look at some of the reasons behind this apparent innovation which are rather more complex than one might suspect. Is the Party truly losing the support of the people? It depends on how you put the question. After Mao’s death, the Party gradually shifted the basis of its legitimacy from Communist dogma to nationalism, specifically, the promise of reviving China’s lost status in the world, rectifying the “century of humiliation” at the hands of foreign powers, and of course, bringing economic prosperity. On every count, it has delivered astounding results while maintaining what, after the turmoil of the Cultural Revolution became the prime value of an entire generation: stability. The Party, therefore, has unparalleled legitimacy. On the other hand, despite continued attempts at reform, the problems of environmental degradation, labour abuses resulting in shortages of willing migrant workers, virtual theft of land undertaken in the name of development, regional inequality, inadequate social infrastructure and a host of other problems remain rampant. The most damaging of these for the Party’s image is corruption on the part of high party officials and their families, who inherited the majority of the economy when it was privatised. The damage done by these officials is palpable and economically significant. The Party, therefore, has limited and diminishing legitimacy. Both sides of the coin are entirely valid. It’s a Schrödinger’s cat type of situation. For ten years, President Hu Jintao did next to nothing about these problems, despite passionate speeches on the subject by his premier, Wen Jiabao. Many now believe that this inaction was the result of the fact that they belonged to the wrong camp within the Party. Neither was a princeling, a descendant of the founding members of the party, and neither was of the same conservative camp as Hu’s predecessor, Jiang Zemin, who was the silent elder of the Party. Hu, always a compromise candidate, never had the personal influence to make significant reforms. Xi Jinping, on the other hand, is a princeling and almost certainly sponsored by Jiang’s wing of the Party. If only Nixon could go to China, then only Xi or someone like him could both establish significant personal authority over the Party and keep it in line while implementing reforms. On the one hand, the prolonged and visible anti-corruption campaign is necessary for public relations, but it is also a means for Xi to secure his own position. Indeed, it should be thought of less as an anti-corruption campaign than an exemplary purge. Almost every high official, especially from the ranks of the princelings, probably has some skeletons in the closet- corruption being very much part of the social culture of Chinese officialdom. The choice of high-level targets, however, has been both exemplary and strategic. First came Bo Jilai, a protégé of Zhou Yongkang and a strong candidate for Standing Committee membership. He was also the most prominent figure in the movement to return the Party to socialist values after years of unchecked demolition of the welfare state. Whether Bo was motivated by any sort of conviction or merely the political advantage of traditionalist iconography, the idea of judging the actions of the Party by its own founding doctrine was seen as profoundly threatening. Bo’s implication in the murder of a Westerner may have made his downfall inevitable, but it was also a convenient opportunity. Another high-level target was Jiang Jiemin, a senior figure in both the state-owned China National Petroleum Corporation and the administration of the powerful State-Owned Enterprises. His career was also facilitated by Zhou Yongkang, a fact that led some to predict that Zhou himself was the ultimate target, as head of a power bloc in rivalry to Xi Jinping’s own. Then there was General Xu Caihou, retired Vice-Chairman of the Central Military Commission, the senior military officer under Hu Jintao’s government. Now, we have a former head of the security services. These three elements, the security services, the army and the state-owned enterprises, represent the three legs which support the Party in power, and the message is loud and clear- Xi can go after anyone he wants to in any of the three on the pretext of corruption, and the people will support him. Not since Mao has personal loyalty to a leader been enforced so emphatically. Whatever course Xi plots for the Party and the state, it is fairly clear that liberal reform is not a part of it. Between the tightening of censorship and the arrest of anti-corruption demonstrators and other pesky intellectual types, and virtual silence in other problem areas at the very moment when China is struggling to make up for lost offshore manufacturing with high-tech industries and domestic consumption, the picture of the future does not look promising- and that future is increasingly Xi’s to shape. As for the anti-corruption campaign, it is a rousing success, having delivered to Xi both a much-needed dilution of public cynicism and the chance to firmly secure his own position. With the US government in partial shutdown, publicly-owned shipyards are furloughing workers and restricting activities to critical maintenance. This sort of thing will have far-reaching implications for the readiness of the world’s largest navy. Time may be running out for the A-10, the world’s best close-support aircraft. The Chief of US Combat Air Command has said that if sequestration continues, the “Warthog” will be sacrificed to fund the F-35 and the role passed to that aircraft. The Army, understandably, is not happy. It isn’t just an issue of the A-10’s famous 30mm Gatling cannon- the F-35 is a more delicate platform with a higher minimum speed, and would have to carry out the close support role from a distance and at speeds that make it difficult to distinguish the situation on the ground. It will also of course be much more expensive, something that will become instantly apparent the first time an F-35 takes ground fire. An A-10 can be shot to pieces, fly home with its pilot safe and be repaired and back on the line in a matter of days or weeks. An F-35 in that situation would be a total loss. Tom Clancy, author of such classic techno-thrillers as The Hunt for Red October and Red Storm Rising, has passed away at the age of 66. In his memory, USNI republishes his 1982 article advocating hovercraft as nuclear launch platforms. Not perhaps the tribute he might have wanted. Clancy was a man with a clarity of vision about his country’s potential and role in the world, which the country unfortunately did not share. Argentina is replacing old Mirage IIIs in its inventory- with used Mirage F1s from Spain. The Argentine armed services have been unable to recoup their aging equipment stocks for decades, and that seems unlikely to change. China’s J-31, the “other” stealth fighter, is likely destined for export, filling demand for stealth aircraft created by the F-35 among the sort of countries America doesn’t sell to. The Diplomat on tensions in the Russo-Chinese relationship- still rosy on the outside, but Russia is struggling to show its neighbour that it is still a great power to be dealt with. Russian suspicions of China’s strategic intentions go back to the Mao era, and are compounded by Russia’s history of invasions from the east and geographic indefensibility. Paranoia, perhaps. Meanwhile, Russia is irritating China through its enhanced strategic ties with Vietnam and its involvement in that country’s offshore drilling exploration. Vietnam has ordered Su-30MK2 aircraft from Russia as well as a new batch of Kilo class submarines. If the Americans were making those sales, China would call it containment. Although Vietnam’s navy and air force are in no position to take on China, Vietnam plays on its previous record of fighting against the odds to intimate that it could raise the cost of hostilities prohibitively. At the 65th anniversary of the founding of the South Korean Armed Forces, the ROK Army paraded a new land-based cruise missile (caution, the picture in the BBC article was of old Nike Hercules SAM variants). South Korea already has a land-attack cruise missile capacity. After years of hemming and hawing on both sides, Taiwan is again saying that it wants to buy new American weapons, including a replacement for its F-16s. Taiwan, which held undeniable military superiority over the People’s Republic of China at the turn of the millennium, now faces a People’s Liberation Army that has modernised in every dimension and holds vast numerical and technological advantages. Canada paid $1 million to a German contractor to produce noise-monitoring equipment for the Victoria-class submarines several years ago. Not only was the product not delivered, it seems that the company is no longer registered in Germany, although CBC News has found a trace of them in Turkey. While Canada’s defence acquisition programs could fill textbooks with examples of what not to do, one usually expects that contractors for such major pieces of equipment would be internationally known. Meanwhile, the Chinese press has been riveted by an innovation– a relatively open trial of a senior Party official. Son of Bo Yibo, a powerful Party elder, Bo Xilai rose to the position of Secretary of the Communist Party in Chongqing, simultaneously holding a Politburo seat, until his wife Gu Kailai was implicated in the death of a British citizen and the Chongqing police chief claimed that Bo was involved in widespread corruption and abuse of power. Bo’s ongoing trial has captivated Chinese media. Never before has the evidence against a senior official been laid out so publicly. Usually, such trials are conducted behind closed doors, as the trial of Gu Kailai was, and very little of the legal process happens in the courtroom in any case. Why the exception? Bo became a powerful figurehead for the Party’s populist wing, surrounding himself with the trappings of Maoist “red culture.” The populists believe that the Party has deviated from its principles by failing to use its newfound wealth to balance the economic inequalities and address the problems of development that still claim far too many casualties in China. While Bo himself was rather circumspect on most of these issues, the Party might well think it wise to let this sordid courtroom drama play out in the public eye to disabuse the populists of their fallen hero, rather than risk turning Bo into a martyr. There was believed to be substantial apprehension among the wealthy Party elite when it looked as though Bo Xilai might rise to the Politburo Standing Committee during the transition of power last year. There is, after all, no rhetoric that can be more powerfully used against a Communist Party than Communist rhetoric. Given China’s slowness to balance the inequalities of development, the populists do indeed have a popular case. So the Bo trial is not the beginning of a new age of transparency, nor is it any less unthinkable that Bo would be found innocent than any other official the Party puts on trial. It is simply that the Party has judged it safer to air some of its dirty laundry in this case than risk the entire case being seen as an attempt to crush a popular leader. Iran has announced that it will soon unveil a number of domestically-produced weapons systems, notably including a new submarine. Given the record of Iran’s past domestic defence products- midget and subscale submarines, “destroyers” that anywhere else would struggle to qualify as frigates and alleged stealth aircraft built on the scale of jet trainers, it probably won’t be anything to get excited about. The Gulf States, of course, will be watching closely, as will the United States and Israel. An article at Foreign Policy.com highlights (or repeats) an interesting truth of the digital age: that many pieces of information that were once products of professional intelligence gathering can increasingly be found through open sources. Daniel Prieto asks what we can do to leverage the march of OSINT more effectively. On Thursday, Japan intercepted some Russian Tu-95 “Bear” bombers intruding in its airspace. Although some might think such intrusions the main purpose of the Bear fleet (in its career since 1956, the turboprop-powered bomber has probably become the most intercepted aircraft of all time), it is an unusual blip in an otherwise cordial Russo-Japanese relationship. Ordinarily, I would be happy to let others deal with Jagdish Bhagwati and Amrita Narlikar’s egregious Financial Times Op-Ed on the aftermath of the Bangladesh factory disaster. In it, they argue that Western corporations should not take responsibility for the conditions of the factories in which their products are made, arguing, typically if somewhat sickeningly, that to do so will harm the workers more than it helps due to increases in the price of the goods. However, they make the claim that “Again, there is no correlation between unionisation and safety. In the US, industrial fires have become rare while unionisation rates have fallen to negligible levels in the past four decades. The garment industries in Vietnam and China have experienced few fires, even though unions do not exist.” That launches them into my ballpark, and so I will happily punt their disingenuous article right back at them. As someone who has written several articles and academic papers on the subject, I can say with authority that there are most certainly unions in China and Vietnam. Granted, they are state-run, and the Chinese ACFTU in particular has a long way to go before calling itself an effective advocate for workers’ rights, but they, grassroots labour movements and other institutions with an interest in labour peace, such as the Vietnamese Ministry of Labour, have moved mountains for workers’ safety, and continue to do so. There is a direct correlation between labour organisation and worker safety, whether the organisation is formal or informal– in fact, through no other means can workers in industrialising nations expect to secure their safety. Nowhere is this better illustrated than in China and Vietnam. Because there is no pity left in me after reading this article, I’ll just lay it on. An early case was that of silicosis-affected workers in the Chinese gemstone industry. When management attempted to evade responsibility through deception and coercion, the workers fruitlessly exhausted every avenue in local government, including the unions, the labour bureau and the courts. Although the legal process tried to segregate their individual cases, group dissatisfaction led to escalating demonstrations with support from workers at multiple factories. They sought and gained international publicity. Finally, only by travelling to Beijing were the gemstone workers able to have the matter taken out of the corrupt hands of their local government. Since that time, both China and Vietnam have introduced labour laws and safety regulations that in theory are among the best in Asia, largely through the influence of their respective unions. Although wary of funding grassroots organisation among the workers for political reasons, both unions have been extremely active in the legislative arena, trying to get effective safety and quality of life legislation in place. Enforcement, as we see below, is far better in Vietnam than in China, but nevertheless, the unions in both countries are the main official movers behind workplace safety. The other side of the coin, of course, is grassroots worker organisation and protest- the larger it is, the more both party-states have an interest in placating it. The Vietnamese state union, the VGCL, has evolved a number of alternate means of representation and labour advocacy which bypass the ineffective workplace unions. The VGCL-run labour newspapers, especially the national Lao Dong (Labour) and Ho Chi Minh City Nguoi Lao Dong (Labourer), can provide an alternate channel for worker grievances. Workers can tip off the papers to abuses and impending disturbances in person, in writing or via 24 hour hotline, and the newspaper will send investigative journalists. These papers sort, analyse and publish grievances, as well as he causes of strikes. They have some freedom to criticise ineffective government monitoring and sanctions, as well as harmful industrial practices such as maintaining shell companies. With independent budgets based on advertising, staffed by young journalists responsible for discrete areas who know the workers’ conditions and backed by a loyal readership, these papers can effectively facilitate conversations between workers, government and industry. This public forum not only puts pressure on the union and government to act, but moves the issue of labour rights into the realm of public input and debate, a conversation that may be the most direct and effective link between workers’ concerns and official action. Vietnamese unions may also join international unions and accept international donations. Vietnam sees improved labour practices as a means of attracting investment. The VGCL has been able to take advantage of the anti-sweatshop movement and emerging international standards, for example by collaborating with Social Accountability International with funding from the US State Department to improve labour standards, simultaneously urging factories to apply for SA8000 certification. The “foreign” nature of these standards is not seen as outside interference nor is it a cause for debate. If anything, these efforts constitute a new kind of effort to expand market access and investment. The VGCL notably also permits its constituent regional and industrial organisations to engage with international labour organisations. Several of the industrial unions have taken the opportunity to connect with international unions in corresponding industries. While VGCL officials have made it quite clear that “propaganda… about independent/multi-labour unions, apolitical labour unions, labour unions fighting for economic goals etc.” is to be resisted, this political boilerplate has not deterred it from productive engagement. The VGCL, and particularly the National Union of Industrial Workers, has been able to translate its freedom to associate with international unions into both a knowledge of international labour issues and considerable freedom of action. The VGCL delegation to an International Garment, Textile and Leatherworkers’ Federation workshop which proposed negotiating a Southeast Asian framework agreement with Pou Chen, the largest footware production company in the world, was able to immediately pledge participation without consulting with higher authorities. The head of the delegation was vice president of the NUIW. The VGCL and Ministry of Labour have benefitted from the technical assistance and training provided by the ILO and international unions, although this does not filter down to workplace unions. Corporate codes of conduct originating overseas seem to be gaining ground enforcing labour rights in Vietnam where the VGCL is not. Third party international monitoring of labour practices is increasingly common. In all of these areas, the VGCL and Ministry of Labour have shown themselves politically able to both accept foreign assistance and use it pragmatically to enhance their own domestic programs and goals. There is also a difference between the state unions of China and Vietnam. Managers imported from the PRC to work in Taiwanese factories in Vietnam not only noted the marked difference in the power of factories to violate labour laws, for instance through illegal overtime, but attributed it to a proactive attitude on the part of the government. One said, “In China, we had to work much longer, sometimes until 1:00 or 2:00 am… In Vietnam, you cannot force workers to work after 10:00 pm. Why is there such a difference? The government. The Chinese government wants to make money and therefore just neglects workers’ rights.” Likewise, the VGCL’s struggles with the government have been widely reported, giving it significant credibility, while the ACFTU cannot hope for such ideological autonomy. And this attitude extends to other branches of the Vietnamese government. In Ho Chi Minh City, the local Department of Labour was so convinced of the importance of labour peace that they made it a practice to go out and find workforce complaints and make sure that they were properly mediated, rather than waiting for the workers to come forward. In summary, even state unions have critical roles to play in enforcing workplace safety, particularly in Vietnam. Bhagwati and Narlikar place the responsibility for safety solely on the employers, as though without pressure from their international customers or effective labour organisation they would have an incentive to do anything about worker safety, even if, as the authors suggest, the West provides safety experts to help them. Every measure of progress in this area in the developing world has occurred because of increased awareness on the part of foreign companies and investors, and increased organisation on the part of the workers and those paid to represent their interests. Does this reduce the ability of industrial development to ‘lift the workers out of poverty’? I would argue that it is seldom the workers who are lifted out of poverty- witness the Chinese migrant workers who since 2009 have begun staying home on their farms rather than coming to the cities to work long hours in dangerous workplaces for wages that will never allow them to improve their own standard of living. But as long as the workers are helping the managers out of poverty, and helping us to cheap goods, making sure that they stay alive through that process seems like the least we can do. It would be one thing if Bhagwati and Narlikar had critiqued the effectiveness of the particular approaches being taken in the case of Bangladesh and proposed effective alternatives. Instead, their conclusion boils down to “Blame the owners but do not try to penalise them or provide any structural means of assuring worker safety, and it will all work out.” In that, their article is not merely useless, but camouflage for the indifference of trickle-down economics at its worst. 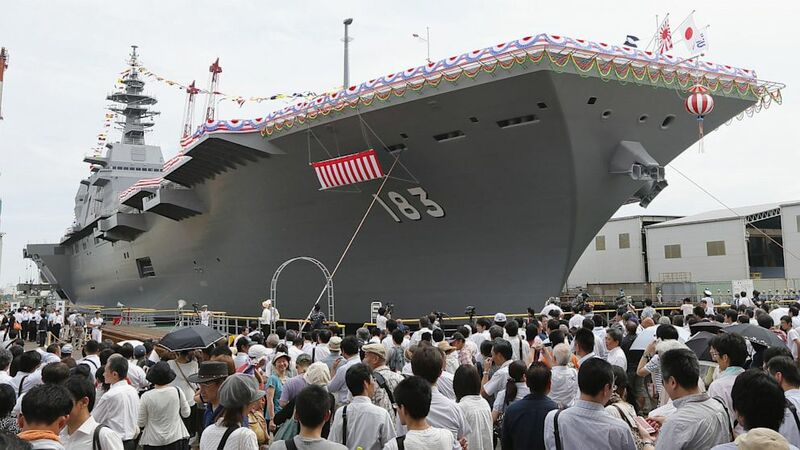 Further to my posts on military doctrine and naval warfare in East Asia, and Mark’s posts on Air-Sea Battle, James Holmes reports over at the Diplomat on a debate that’s been heating up. Specifically, the question is whether Air-Sea Battle is needlessly escalatory, and whether, surprise surprise, a naval blockade approach (as for example the one suggested by Kline and Hughes a while ago) might be the better approach to a notional future conflict with China. Holmes provides some good sources and analysis, but unfortunately doesn’t seem to have heard of Kline and Hughes’ take, dubbed “War at Sea,” going with Hammes’ somewhat less innovative “Offshore Control” concept instead. Some of the caveats that arise toward the end of the article might be better answered under the former framework than the latter. Meanwhile, South Korea’s fighter competition seems to have reached a point where Boeing’s Silent Eagle is the last bird flying. The F-35 broke the bank, and the Eurofighter consortium seems to have fudged some of their paperwork. The Silent Eagle is an untried, radar cross-section reduced F-15 variant. Its low-observable characteristics depend on carrying missiles internally in what used to be the F-15 conformal fuel tanks, which both reduces range and provides only a four-missile capacity. Of course, it has all the expected goodies in terms of avionics, but it still lacks the various aerodynamic upgrades tested on the F-15 airframe. What’s so great about that? Well, for one thing, the Koreans really wanted a stealth aircraft, since China and Japan will both have stealth aircraft. While it is highly doubtful that Silent Eagle is any more stealthy than any other Generation 4.5 fighter (bearing in mind the F-15 layout was not designed for low-observability, unlike the Typhoon), the name might carry some weight. Also, South Korea already has a fleet of relatively new F-15Ks, so there are advantages in standardisation. The US Air Force has a new idea for reconnaissance in Chinese airspace. Forget the U2s, the SR-71s, the recon satellites- the future is in drone bugs, tiny, self-recharging, semi-autonomous UAVs, or so Air Force reps told the Association of Unmanned Vehicle Systems International’s annual conference. The reasoning is simple: you can’t shoot down a swarm of bugs with an S-300 missile (and even if you could, you’d look pretty silly doing it). I’ve argued elsewhere that drone technology is a Pandora’s box, not only or even primarily because of its ethical implications for warfare, privacy and government abuse, but rather because the more governments fund drones’ development, the more the technology will proliferate and come within economic reach of unstable regimes, terrorist groups and the general public- the latter is already happening in commercial applications. The smaller and lower-altitude the drone, the harder to contain or control it becomes, and self-sustaining insect drones are from this perspective just about the worst thing one could invent, precisely because they are likely to become cheap and widely accessible at some point. Another question is in what circumstances this capability would be used. It is one thing to confine it to crisis situations, but to use it in peacetime would guarantee a similar response. Constant low-level drone warfare is not a good idea or a good precedent, especially between great powers. Meanwhile, as Shane Bilsborough reiterates over at The Diplomat, China isn’t so very far behind in either drone warfare in particular or the field of information dominance in general. This should come as no surprise- the 1991 Gulf War was a tremendous wake-up call to a number of rising militaries, and the lessons of the information-age battlefield translated very quickly in China into a new set of command, control, communication, computer, intelligence, surveillance, and reconnaissance (C4ISR) doctrine on the one hand, and a corresponding offensive doctrine to disrupt these capabilities in an attacking force. These trends are well-represented in the book Chinese Views of Future Warfare , an anthology of translated Chinese articles. China regards electronic, cyber and space-based warfare as the new “high ground” of naval warfare, assuming the place that air power has held since the Second World War. For the cyberspace part, see Richard Stone’s in-depth account of China’s development of offensive cyber capabilities in the March 1st 2013 issue of Science Magazine. A second aspect of this trend is China’s development of a wide range of relevant equipment, including Airborne Early Warning and Control aircraft such as the KJ-2000, which are believed to be a generation ahead of American AWACS in sensor capability. And of course, China has developed and is believed to be mass-producing a full range of drones, from small battlefield models up to Global Hawk equivalents. The latter are of particular concern if they should be used for naval strike. There are other, equally dangerous missions which have been tested in recent exercises, including disruption of enemy communications and facilitation of friendly ones. Target-finding and designation are equally important- as China’s array of long-range anti-ship missiles, including ballistic missiles, grows, finding and coordinating strikes against target vessels becomes a networked function. In addition, China now has a full range of surveillance satellites for situational awareness and soon, targeting functions. In short, China is no pushover in any aspect of C4ISR, least of all drone warfare. Its one major problem is coordination and equipment compatibility between different branches, exacerbated by inter-service rivalries. Back the United States, which is beginning to introduce a new generation of tactical network, Rockwell Collins’ Tactical Targeting Network Technology (TTNT). The idea is to create a jamming-resistant, frequency-hopping, secure ad-hoc network over a large battlespace with long range and low latency. It is being installed on the E-2D Hawkeye AEW aircraft, the EA-18G Growler Electronic Warfare Aircraft, and is the control link for the X-47B carrier UCAV. In future, it may supplant current systems such as Link 16. The Growler installation is particularly interesting, since one of the touted abilities of the aircraft is to jam enemy communications links while maintaining friendly ones. The significance of TTNT is its presumed capability to resist electronic warfare measures, such as those China is keenly developing. One wonders how many ways the electromagnetic spectrum can be sliced and diced before becoming useless to everyone. On a different note, James Holmes’ article in Foreign Policy (and related note at The Diplomat) does a good job highlighting some of the imponderables of China’s naval development, as well as some of the differences in naval thinking between China and the West. I’m not one to wade into the debate over America’s future as a world power, but if you’re interested in the state of the issue from an academic perspective, here’s an article that summarises it fairly well. I did this once before for my MA Thesis, and there have been a few changes since then. This series of articles will compare the major navies in and around Asia, and one or two of the not-so-major ones, in blunt materiel terms. I am well aware that there are many variables in terms of training, doctrine, support etc. that this analysis leaves out, but here we go anyway. Today’s edition kicks off with carriers and air defence. The US Pacific Fleet currently has six aircraft carriers assigned. While reductions in this number are always possible given budgetary sequestration and the excessive cost of the new Gerald R. Ford class carriers, the US carrier force will remain larger and more capable than that of any potential opponent for the foreseeable future. Nevertheless, many would say that the carrier air wing is at a historic low point in both variety of capabilities and combat capability relative to major air forces. The Hornet and Super Hornet fighters which are the mainstay of the air wing are anemic in gross performance characteristics, notably range and speed, compared with many Generation 4 and 4.5 fighters. Meanwhile, US carriers have lost their dedicated attack, interception and fixed-wing ant-submarine components. The one dedicated capability they have fortunately retained is electronic warfare aircraft, and the EA-18G Growler is supposed to be quite capable in this area. 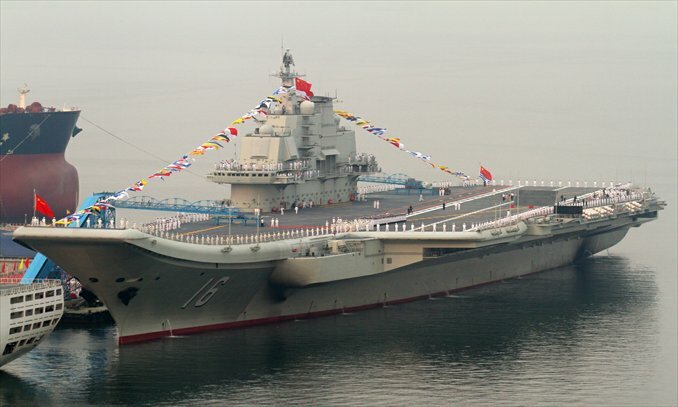 China has one Russian-built Kuznetsov-class aircraft carrier in commission, the Liaoning. Its air wing will consist of up to 30 J-15 Flying Sharks, a locally-produced copy of the Russian Su-33 carrier based fighter, and up to 24 helicopters including the airborne early warning Ka-31. The J-15, which is an unauthorised product of reverse-engineering, is likely to suffer a number of problems common to Chinese-engineered fighters, including weak engines and avionics trouble. The Liaoning possesses none of the Kuznetsov’s considerable armament, the tubes for SS-N-19 and SA-N-9 having been removed. It retains only close-in defence capability. China is believed to have indigenous carriers in production, and plans for up to three have been mentioned in the press. This will be very much the carrier force that the Soviet Union never built, using the same concepts and similar aircraft. Strategically, it is hard to see carriers being useful tools of power projection for China. Within the first island chain, land-based aircraft will always be more significant. Along the westward trade routes and into the Indian Ocean, the only nations worth bringing a carrier for could also overmatch a Chinese carrier force fairly quickly, or else whistle up those who can. Nevertheless, carriers are an important status symbol for an aspiring power. India has one carrier in commission, the INS Viraat, formerly HMS Hermes. Her fixed-wing complement consists of early-model Sea Harriers which lack the Blue Vixen radar and AMRAAM capability of the FA2. Upgrades with Israeli radars and Derby missiles are ongoing, however, force numbers have fallen. Regrettably, India did not purchase UK Sea Harriers as they went out of service, which could have seen the force serve alongside the MiG-29K for years; instead, the force is dwindling in numbers. 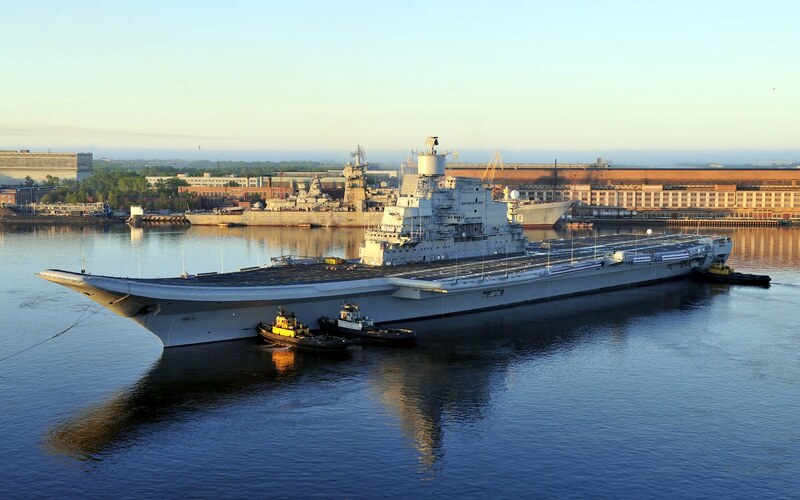 The carrier Vikramaditya, the Kiev-class Admiral Gorshkov modified with a ski-jump, has experienced vast funding overruns and five years’ worth of delays, but looks set for delivery this year after finishing sea trials. Its fixed-wing complement will consist of up to 24 MiG-29Ks. These aircraft are not comparable to the new MiG-35 version of the Fulcrum, but have improved avionics an ordinance carriage compared with the original MiG-29. 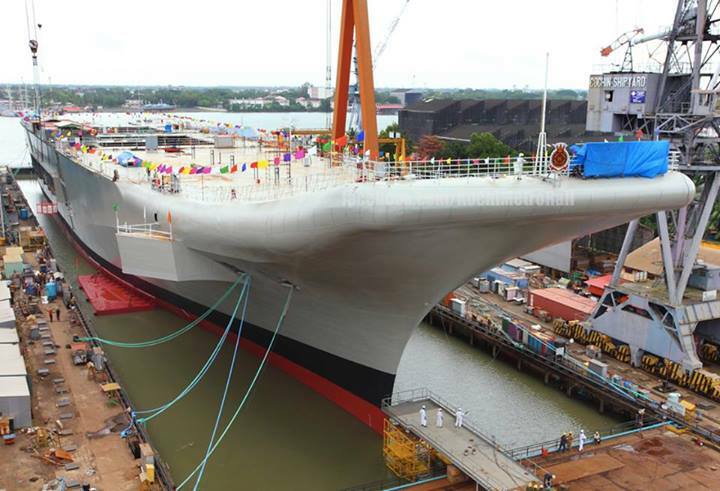 The locally-built carrier Vikrant was launched recently, and is expected in service toward the end of the decade. Like the Vikramditya, it is of STOBAR configuration. India plans up to two more locally-built carriers of a larger design. While Japan has no fixed-wing carriers, it possesses helicopter-carrying flattops with announced patrol, ASW and humanitarian aid missions. The hulls should be amenable to conversion into V/STOL or, in the case of the Izumo class with a more extensive refit, STOBAR or CATOBAR configuration. The two Hyuga class destroyers are comparable in size to European V/STOL carriers, while the Izumo class (of which one was recently launched and another is building) are comparable in size to US Essex class carriers. No plans for fixed-wing complement have been announced, but the possibility has caused significant speculation. 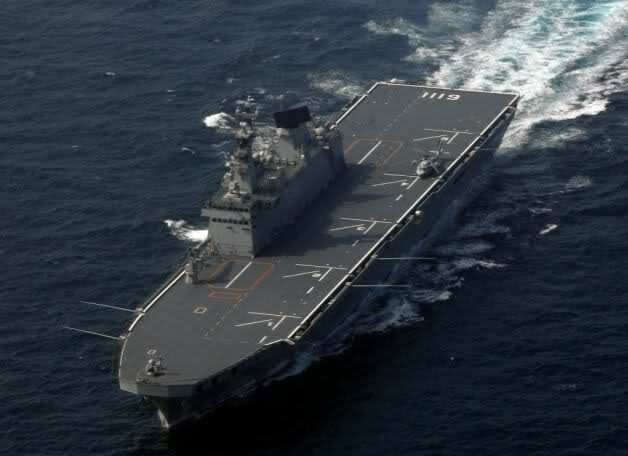 South Korea possesses two flattops in the form of the Dokdo class Landing Platform-Helicopter. Comparable to the Hyuga class in size, the South Korean government has reportedly considered the addition of the F-35B fighter to the Dokdos’ current air wing of helicopters, although their number would be limited. The class is provocatively named, after islands currently in dispute with Japan. Australia has ordered two Canberra class Landing Helicopter Docks from Spain’s Navantia, based on the same design as the Spanish Juan Carlos I. Unlike the latter, and despite the presence of a ski-jump, there is no plan for fixed-wing aircraft, although the F-35B would be the obvious candidate. The Chakri Naruebet, or “Chakri Dynasty,” is an earlier edition of the same design lineage as the Canberra. It was initially planned to operate a mixed air wing of helicopters and Matador aircraft, early-model Harriers. However, the Matadors’ maintenance problems rapidly left them unflyable, and the ship reduced to a helicopter carrier. Chakri Naruebet has spent much of its career at anchor due to financial problems. American fleet air defence capabilities are second to none, at least in terms of numbers. With 22 Aegis-equipped cruisers and 62 Aegis-equipped destroyers, no nation has ever had such a numerical lead in this area. Eleven cruisers and thirty-one destroyers are currently home-ported in the Pacific area. The Aegis system is also present on Japanese and South Korean destroyers, and will equip the Australian Hobart class. Leveraging this interoperability significantly increases the system’s reach. However, Aegis is not flawless. The additions of SM-3 for anti-ballistic missile functions, the replacement of SM-2MR with the much longer-ranged SM-6 and the addition of Enhanced Sea Sparrow for terminal defence makes the ordinance side of the system extremely solid going forward. The radar side of the system is increasingly long in the tooth however, and not only are the current AN/SPY-1 radars not active electronically scanned, placing the system somewhat behind global par, but none of the prospective replacements are likely to be compatible with the current fleet due to weight and energy requirements. After methodical experimentation in the 2000s with various air defence designs, the PLAN seems to have standardised along a two-tier system. The Type 052C/D destroyer carries the long-range (~200 km) HQ-9 missile, based on the Russian S-300 system for fleet defence, while the Type 054A frigate carries the highly capable medium-range HQ-16 system, a version of the Russian Shtil (SA-N-12) as a second layer. 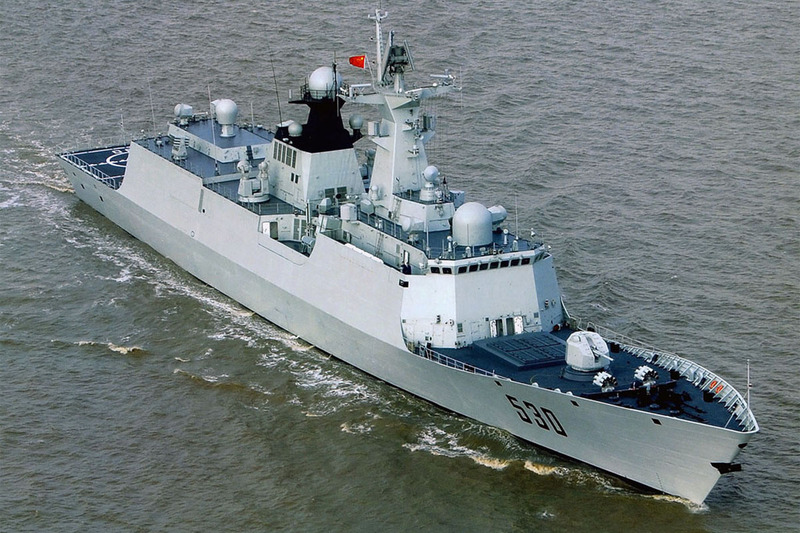 Both hulls are in series production, with 6 Type 052C, 8 Type 052D and 20 Type 054A vessels known to be planned. In addition, China has two destroyer hulls each (Type 051C and Type 052B respectively) carrying S-300 and Shtil, the legacy of experimentation. Overall, China has developed a substantial area air defence component, greater than Japan’s in number of hulls so equipped, but the PLAN overall still contends with a significant number of legacy vessels with much weaker air defence. The main question at this point is whether China’s existing equipment can match foreign systems in terms of radar performance and especially network integration. Japan has two Atago and four Kongou class destroyers equipped with the Aegis system. These hulls are based on the American Arleigh Burke class layout, with the Atagos being equivalent to Flight IIA vessels. Despite this substantial capability, Japan has yet to plan for additional units, as compared with China’s continuous production. Other hulls use Aegis-compatible missiles, but overall, the JMSDF is falling behind its neighbour in this area. 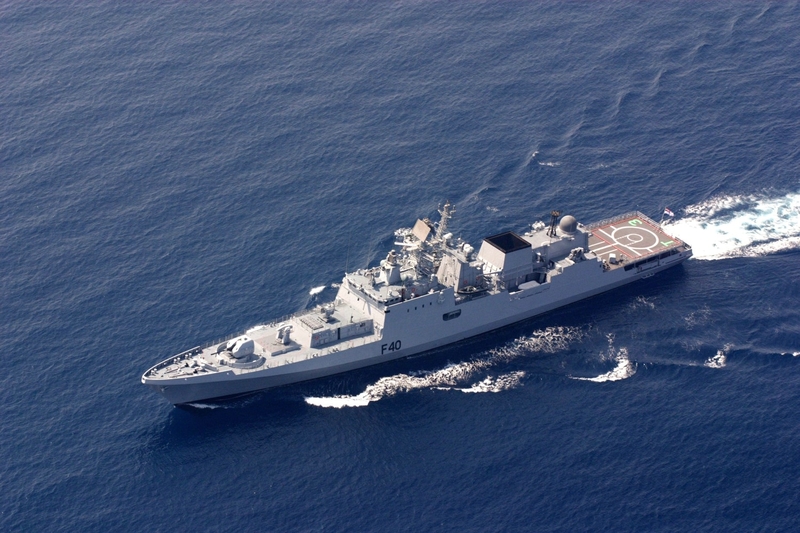 India thus far has a somewhat weaker area air defence capability, based primarily on the Shtil systems installed on its expanding fleet of Talwar and Shivalik class frigates. Despite updates, the system depends on legacy Russian radar systems. The forthcoming Indo-Israeli Barak-8 system on the Kolkata class destroyers will have an advanced AESA radar, but is still a medium-range system. 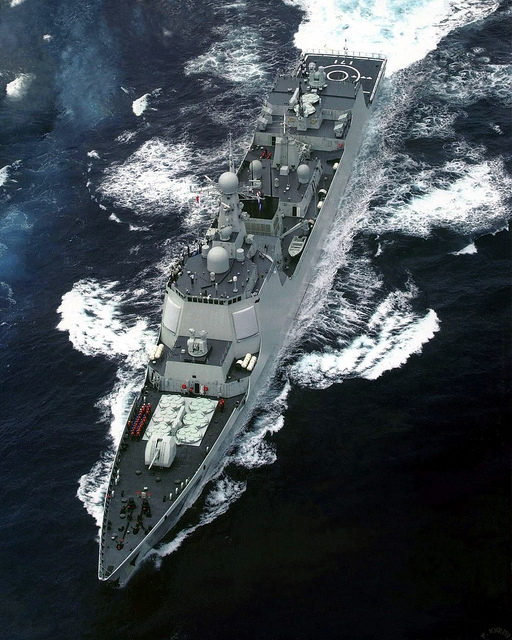 South Korea’s fleet air defence capability is concentrated in its three superb King Sejong the Great class destroyers. Another Arleigh Burke variant, the “KDX-III” is a far more capable multi-mission platform than American Burke, but so far lacks the new SM-6 missile, and, bizarrely given the North Korean threat, has not been given Ballistic Missile Defence capability. Australia’s three forthcoming Hobart class ships, based on the Spanish F100 design, will carry a truncated version of the Aegis system, with the SPY-1D radar and a 48-cell vertical launch system for SM-2 (possibly SM-6) and Enhanced Sea Sparrow missiles. They are capable ships for their size, and a considerable boost, considering that the RAN’s closest brush with area air defence has been upgrading the Adelaide class (based on the US Perry class) to fire SM-2 missiles. However, three ships is not much for a country the size of Australia to bank on. Taiwan’s naval area air defence rests with the four Kee Lung (US Kidd)-class destroyers. While upgraded before transfer in the 2000s and good air defence ships for their generation, they lack a modern radar set and combat system such as Aegis to back up their SM-2MR missiles. Though puissant when acquired, the Kidds have rapidly fallen behind PRC equivalents. 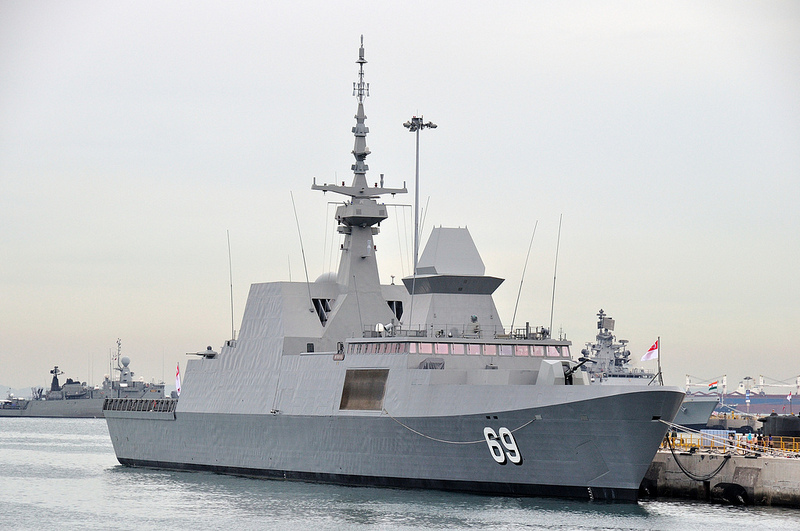 Singapore’s six Formidable-class frigates are based on the French La Fayette line of frigates, and are by far the most capable variant of this design, carrying a combination of Thales Herakles radar and 32 Aster 15/30 missiles which foreshadowed the FREMM frigate project. While not as substantial in radar outfit or number of missiles as some of the major powers’ air defence ships, the Formidables are the only substantial naval air defence in Southeast Asia, and just might be the best frigates for air defence in Asia.